Podere Castel Merlo, located in the municipality of Villongo in the province of Bergamo, was founded in the fourteenth century as a fortified building for defensive use, located in a hilly area cultivated with vineyards. After enduring mediaeval conflicts that destroyed one wing and successive centuries of rebirth and abandonment in alternating phases, Podere Castel Merlo returns to splendour with its acquisition by the Buelli family, which annexed the structure to the family wine estate. Today you can still feel the ancient origins throughout the castle; the sturdy stone bases, stone retaining wall, underground wine cellar and ancient well preserve all the charm of the pre-existing fortification. From the original frescoes, to the old columns that are still present in the structure and, thanks to the passion of architect Alessandro Agrati, a fantastic atmosphere emerges that manages to combine modern elegance with elements dating back to past centuries. 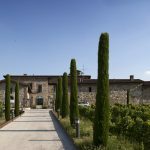 Today, Podere Castel Merlo has been reborn as a luxury Relais and is living a new story. Immersed in vineyards characterised by a terroir of great value, it has 7 Suites, an elegant SPA and a prestigious events area with a restaurant where you can taste cuisine created by the best chefs in collaboration with Davide Oldani. Our line of Podere Castel Merlo wines has its origins in cultivation of the best vines selected over time.